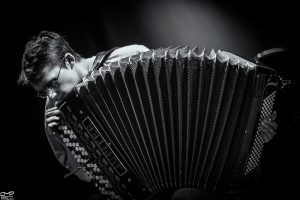 Ryszard Lubieniecki – composer, accordionist and improviser from Poland. Student of Music Academies in Bydgoszcz and Wrocław. In 2014 he founded the contemporary music ensemble Trio Layers with students from Bydgoszcz (Zofia Ilnicka – flute, Jakub Wosik – violin). His music was performed at Contemporary Music Festival „Nowa Muzyka” in Bydgoszcz, Gaudeamus Muziekweek in Utrecht (Netherlands), 17th Annual Percussion Workshop Symposium Trstenice 2013 in Trstenice (Czech Republic) and Musica Privata IV in Łódź.